Tuesday’s & Friday’s are my days of rest… or should I say were my days of rest! They are when Mini Meldrum is in nursery all day – we have recently upped her time there from 1.5 days to 2 days a week & thankfully this hasn’t been an issue as she truly loves it! It makes me so happy knowing that whilst I am getting a little bit of peace from a very on the go toddler, she is happily playing and doing her own cute little independent thing at nursery! As much as the days aren’t so restful anymore they are just as lovely with me being able to spend lots of quality time alone with Florrie-Belle – just like I got to do with Mini Meldrum. I don’t feel at all guilty for sending Mini Meldrum to Nursery as I know how much she looks forward to going! Safiyah has been at Nursery since just before she turned one. In our village there are 2 private nursery’s and we started off at one and are now very happy and settled at the other! recommendation’s from parents. I think hearing other peoples views on nurseries is a great starting point… however I will say that I wouldn’t always go by other’s opinions be them good or bad. I find in the parenting world that topics such as nursery’s can quickly turn into competitive ‘who’s child goes to the best nursery’ discussions – even if a parent wasn’t completely happy I think they could potentially outwardly express that their choice in nursery was the best. It’s also good to speak to parents at different play groups etc that might not necessarily have children at nursery but may have heard good or bad things from friends/fellow mum’s. Researching a nurseries procedures & policies. They all have them and will all or should gladly show you these documents to help you base your decisions. show up when you are least expected – a good nursery will allow you to come in for a wander & to observe even if they are not expecting you. I would be wary of a nursery that didn’t allow this. Check out an example of their weekly menu. Nutritious and healthy meals are high on my list of priorities for S & I always love to hear what she has eaten. Staff training; the staff are likely to have different levels of training so it’s always good to find out who is trained to what level and what plans are in place for further training. safe surroundings – I love how it’s difficult to get into Mini Meldrum’s nursery. I have to go through two bolted gates & then press a doorbell & wait to be let in. The biggest thing for me is to go with your gut… I think gut feelings and instincts are very good at detecting good or bad situations & I know that I pretty much go with my general feeling towards somewhere/someone. A nursery that suits one child wont necessarily suit another child, different personalities require to be cared for and engaged in different ways so if the first nursery you try doesn’t work out for you don’t rule out nursery all together (I know many wont have this option with returning to work etc) but keep searching until you find the nursery that meets all of your and most importantly your mini human’s needs. 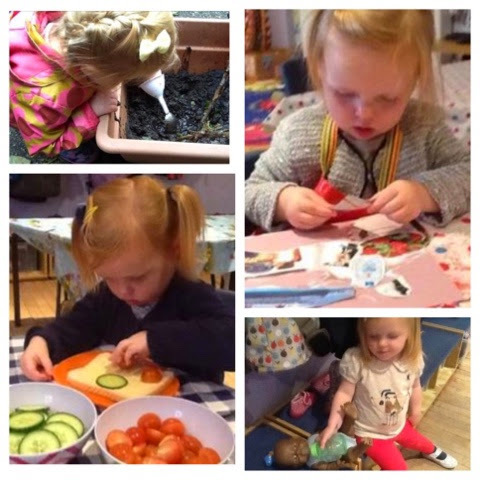 I’ll leave you with a couple of pictures of Mini Meldrum enjoying her days at nursery! Does your little one go to nursery? What tips do you have for other Parents trying to choose the perfect nursery for their toot?